Dr. Dwij Kothari is one of the best Dentists in Chanakyapuri, Ahmedabad. He has been a practicing Dentist for 4 years. He is a qualified MDS Prosthodontics, MDS Endodontist . You can visit him at D&D Dental Clinic and Implant Center in Chanakyapuri, Ahmedabad. Save your time and book an appointment online with Dr. Dwij Kothari on Lybrate.com. Lybrate.com has a number of highly qualified Dentists in India. You will find Dentists with more than 35 years of experience on Lybrate.com. 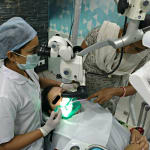 Find the best Dentists online in Ahmedabad. View the profile of medical specialists and their reviews from other patients to make an informed decision. What is the cost to put braces in my teeth. Please tell me how to cure this problem asap. 18000 to >2 lacs. Costs are dependent on time which is required to correct alignment of your teeth and quality of braces. Last dentists experience and skill. What is the estimated cost of dental implants in a tier 2 city? I am told 25000 for Orient company's implant (seems too costly to me). Is there any alternative for multiple teeth implants like permanent teeth set? Implant costs are very from company to company and doctor to doctor. Its basically not only dependant on implant company but also instruments which doctor is using to place that implant, sterilization maintenance of clinic and last Knowledge and skill of doctor. Myself rajbir suffering from dental problem like having bad smell coming from my mouth pls advise. Bad smell can be occur due to teeth and gum problems. And can be resolved by cleaning only. Visit your dentist for proper guidance. If dental hygiene is good than you meed to visit your physician. Take care. i was eating tobacco due to that fibrosis occurred I am not able to eat any spicy food or hot food pls suggest some medicines. Stop tobacco immediately. Start having green vegetables and Start Tab Oxitard once a day for 15 days. Please visit your dentist for proper examination and further guidance. Sir mere muh me new teeth aa gya hai uss ke upar sujan aa gayi mujhe atyadik pida (paining a lot) ho rahi h iss dard se. You need to visit your dentist and get x-ray done. Pain can be due to wisdom tooth but by seeing x-ray we can say if it's salvageable or require any treatment. When I rub my front teeth with nails something white comes in it what is it does it is good for teeth I used to rub daily with my fingernails. It happens due to improper brushing. Visit your dentist and ask him/her to educate you how to brush and also get your teeth cleaned. Please don't use nails or any hard, sharp object on your gums, it damages your oral health. I am 18 years old and normally I feel pain in my teeth when I am eating ice cream, warm milk, hot water etc. I had already used sensodine paste but it results into more pain. please suggest any track. Please Visit your nearest Dentist. You may have Cavity/Cavities in your tooth/teeth, which can cause pain like this. Respected sir from last two months I have a problem with my left side upper jaw teeth. But suddenly from last month I am suffering with a pain refer from head to teeth. And from last three days I seen that a inflammation occurred in my mouth. And pain remain same.in left side. I am too much worried about that. I had already tried cephodoxime with clavulanic acid antibiotics. But no result is there. I am afraid that is it any cancer formation in my mouth? Because I am a regular smoker. Please take some time from your busiest schedule, to visit a Dentist. And don't take Medicines by yourself. I have pain in my mouth near right side ear and throat also I can not open my mouth if I do it get pain but no problem in my tooth I can not understand y it was? According to your history and site of pain, there are chances that 1) your wisdom tooth is causing pain 2) some decayed tooth is causing pain 3) gum infection may be there 4) if nothing from above than consult ent specialist as soon as possible. I am 20 years old male. I have blue black (blend) gums and yellowish teeth. What should I do for healthy gum and teeth. Blue black gum may be due to melanin which varies from person to person and it's not indicating that your gums are not healthy but to get esthetic (pink gums) you can consult periodontist. And for yellowish teeth also you should consult periodontist first. Yellowish teeth may be due to poor oral hygiene, or fluorosis, or side effect of some medicine. It can be get white by just scaling or bleaching or veneer prosthesis.